From the moment Cartoon Network announced this series, the fan excitement has been high. 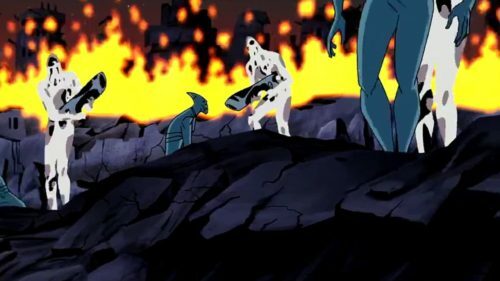 Bruce Timm and his staff rocked the San Diego Comic-Con with only a slide show and a brief clip of the Justice League fighting off alien spaceships. With drips and drops of information leaking out occasionally (will the JSA be included? Aquaman? Kooey Kooey Kooey? ), we’ve whipped ourselves into a foamy lather of anticipation. And this Saturday at 7 p.m., the waiting will finally be over. Only one question remains: are we right to be in such a frenzy? Happily, the answer is mostly yes. This first three-part episode (initially shown in an hour and a half block) strikes a precarious balance between satisfying comics fans and bringing new viewers up to speed. The first half hour wisely sticks to the characters that people already think they know. After an astronaut on Mars (the Timmiverse has a much better space program than we do) accidentally opens a mysterious tomb, we flash forward two years to find Batman breaking into one of his own Waynetech Deep Space facilities. When it turns out that his own employees speak an unrecognizable language, are possessed of super-strength, and are sabotaging the facilities, we can understand Batman’s stealth. But when Superman arrives and is almost immediately incapacitated by a psychic attack, it becomes obvious that the Dark Knight has become stuck in something way too big for him. In a nod to the original War of the Worlds, that something comes in the form of tripods from Mars. If only Superman had not been conscripted into destroying everyone’s nukes by that same astronaut from the beginning, now a U.S. Senator. Left with little in the way of effective defenses, Metropolis looks to Superman and Batman. But they need more power. Far away on a hidden island, a young woman and her mother debate the merits of venturing out to help the world in this time of peril. Elsewhere, a scarlet speedster brags of his abilities. And it turns out that the invaders are not the ones sending Superman the near incapacitating visions. Of course several heroes end up coming a-running by the second half-hour. As such groupings go, Timm and company have done justice to both Gardner Fox’s original vision and Grant Morrison’s rethinking, with a menace very like the White Martians yet cleverly different from them. 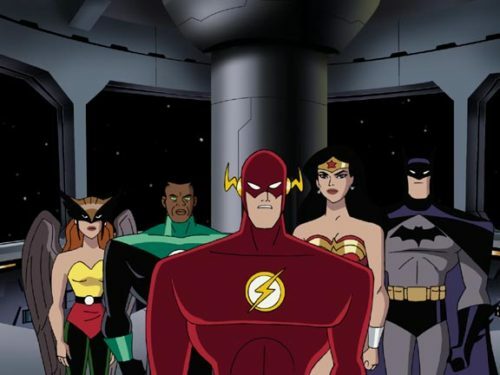 But what about this version of the League? Superman: This time around, George Newbern voices Superman. Aside from sounding surprisingly like Tim Daly from the Superman series, Newbern captures the warm heroism very well. This Superman seems older than the one in his solo series, drawn with a few extra facial lines. And he seems to have completely regained the trust that he (unjustly) lost at the close of the previous series. Batman: Still voiced by Kevin Conroy, the only real difference with this version is another redesign of his costume. He looks more like Bob Kane’s original design than before. And he’s still tough enough to think he can take on a group of super-strong aliens. He’s almost right. Wonder Woman: Diana’s first public appearance as Wonder Woman occurs when she joins in the fight against the aliens. She has very clearly disobeyed Hippolyta to enter Man’s World. If we must compare her to a comic book incarnation, she fits somewhere between George Perez’ revamp and Wonder Girl. Voiced by Susan Eisenberg, it’s very clear that Diana is not just naïve but also young. And Wally West immediately flirts with her as he often did in Teen Titans. The Flash: Though the show does not yet cop to this, the man in the red suit is Wally West. Young, cocky, always ready with a quip, he does not understand his powers as well as he claims, but better than the others think he does. Michael Rosenbaum (who plays the other side of the fence as Lex Luthor in Smallville) adapts his persona easily to The Flash, who even looks somewhat like him. Green Lantern: It may have been the politically correct choice to use John Stewart. But what gets overlooked (at least in this first arc) is that unfortunately, John is the most boring Green Lantern of them all. Sorry, Judd Winick. Phil LaMarr plays John as very gruff and no-nonsense, and his use of the ring reflects that. No giant boxing gloves, no green knights, just rays of force and protective bubbles. Even Superfriends used Hal Jordan more interestingly than that. The spark of hope lies in his trying to keep a close eye on Wally West. It makes this the least likely Flash/Green Lantern team, and yet one ripe for character development. An arc will be devoted to John, so we can’t write him off yet. Hawkgirl: From the information given in this arc, she’s the biggest enigma. (Cartoon Network has provided a bio with a full explanation, but those details do not translate on the screen.) Clearly still Thanagarian, the other heroes treat her like they have fought alongside her many times. Against the aliens, she proves to be possessed of a berserker rage. Time will tell if she gets interesting development. Maria Canals gives her a no-nonsense tone. J’onn J’onnz, The Martian Manhunter: Carl Lumbly gives J’onn an indefinably accented precise English, which fits a guy who learned the language telepathically. The storytellers do not shy away from J’onn’s alienness. This arc belongs the most to J’onn, exploring his Martian heritage with quick but efficient strokes. The best touch lies in his habit of mentally checking out when using his telepathy; it seems to even bother Batman. Snapper Carr: How can you not love that these guys included Snapper? He shows up as a television news reporter. While not explicit here, the door lies open for him to become an unofficial chronicler of the League. 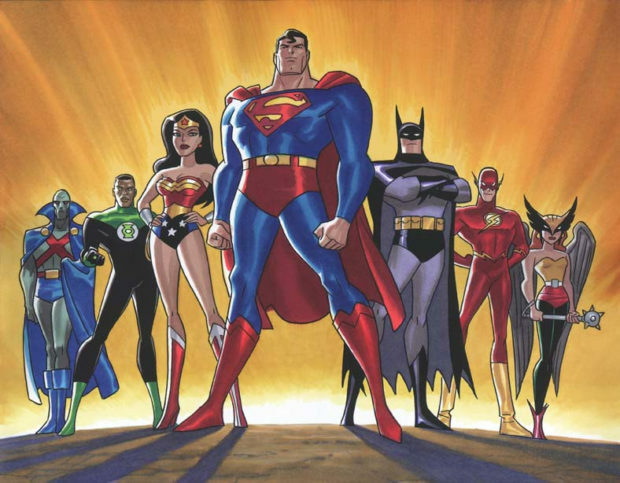 Justice League has a hopeful start. Though it relies heavily on mayhem (cool mayhem) for now, future episodes may find a better balance. And should. Eventually even cool fight scenes become tiresome, and we’re used to great characterization from Timm. Without his partnership with Paul Dini, people will be even more critical. The line-up of future guests will at least keep fans watching, featuring someone for everyone. I’m hooked waiting for Metamorpho. All times Eastern and Pacific.